Paradise does have an address! Island paradise, with ultimate privacy!! A great secluded holiday retreat. We stumbled over this place on the internet and thought it looked great from what we saw and we were not dissapointed, East Bedarra only has about 7 houses and is just a short boat ride from Mission Beach. Want that perfect holiday ??? What a holiday should be! A stunning setting for an Engagement! How can you fault paradise? This was a fantastic spot for our honeymoon. It is set in a truly beautiful part of Australia and has everyting you need and more. Most of all a private and romatic spot to truly relax. The property is perfect. Unfortunately because it is pretty hard to beat it. We were there in April for our anniversary and since then we are always comparing where we are staying with Bedarra, which isn't very fair to the property. Put it on your bucket list and you won't be sorry. The accommodation was clean and spacious with an amazing outdoor deck where we spent a lot of time sun bathing and listening to the relaxing music that can be played through the great tv/speaker system. The care takers were very lovely and greeted us warmly and showed us around the accommodation. We walked around the island to the private beach and went on canoeing adventures several times. There is so much to see and do on this little island paradise- the blue butterflies make you feel like your in a tropical heaven. We loved Bedarra Island and wish to come back one day soon. Without doubt one of the most beautiful places in the world,serene luxury at it's very best Star gazing on the deck at night,swimming in a crystal clear private bay with a loved one could not get any more romantic We spent 3 unforgettable days soaking up the sun,then wine and cheese watching the spectacular sun sets wonderful retreat managed by a warm and friendly couple who cannot do more to fill our every need. Locked in our memories forever. After recovering from nine weeks in hospital (cancer) It was time to find a place to chill out. Quiet relaxing with plenty of time to reflect on the good things in life.What better way to start.East Bedarra island retreat was just perfect with the lovely sun sets your own private beach. The fishing was great snorkelling see breath taking coral right at your door step unbelievable. The villa is 5star everything supplied beautifully presented and self contained and the Hugh big deck to enjoy the lovely views wine and dine.Your own private swimming pool so good. My stay was a dream come true. I will return again it is paradise. Incredible location for our honeymoon, Peaceful, relaxing and beautiful, don’t want to go home. What a perfect place for a honeymoon. This place is really heaven on earth and it doesn’t matter what the weather is like. We are very sad we are leaving today but all good things must come to an end, we will definitely come back one day. What an amazing place, our 1st holiday getaway without the kids and what a place to recharge! Thank you to Sue, Gene and Sharon for all your assistance in the lead up and to Ben & Lindsay for your assistance on arrival – we hope to come back again someday & telling everyone we know about this hidden gem. East Bedarra Retreat offered us something new & unique for our honeymoon. While there are many activities to choose from on the island that we enjoyed, the tranquility, seclusion & natural beauty of this place offers the perfect setting reconnect with each other & remember what is truly important in life. To know & find joy in god’s beautiful creation was truly a blessing! Together we not only took in the beauty of big things but the little things as well. This was a wonderful week well spent! Such a stunning and beautiful place to relax and start our married life together. Thank you for the most amazing holiday and all the beautiful memories. We could not have picked a more special place to celebrate out 30th wedding anniversary it has been perfect, Paradise. Thanks for a spectacular holiday, my girl Sandy for surprising me for my birthday, not much competes with the serenity here. Loved looking at the fish off the balcony & the daily visits from the black & white Angel fish. No words can describe our time here. Thanks for the memories. This is one holiday that surpassed the pictures! After a week of ‘musical chairs’ it is time to leave a truly amazing destination. We had an amazing 25th anniversary in a truly magical destination. What an incredible 5 days of paradise. A beautiful secluded home on a stunning island. So sad to leave but so happy to experience this. Amazing way to spend our 17th wedding anniversary, thank you. Seclusion & Serenity, what a place for our honeymoon, would have to say your place is the most relaxing & private place we’ve ever stayed in. This will be hard to beat, only thing to make this better…. An outdoor spa bath. What beautiful place to celebrate 25 years of marriage – awesome place. We sadly leave feeling very relaxed & already plan our return for 30 year celebrations!! We have never been so relaxed in our lives! This is the prefect place to have started our married life together. Thanks so much! What an amazing place to have our honeymoon!! It was definitely worth the wait to get here!! It was very relaxing and we really enjoyed our stay!! Thank you!! Unforgettable views, beautiful weather, made our honeymoon very special. The time we spent here felt so special that we wished our friends and family could be here for the experience we went through. All we gotta say is THIS IS THE LIFE! What an amazing place, it was just what we needed. Weather was orsm & the accommodation had everything you would ever need. Amazing job re-building Sharon. We had a lovely relaxing time here on this beautiful island, with good weather most of the time. Thanks to Lindsey, Ben, Sharon and Sue for making our time here enjoyable. This was a surprise week away, where my husband of 25 years whisked me out of everyday stress into heaven. It is truly the most superb, relaxing piece of paradise. A wonderful way to celebrate 25 years + my big zero birthday. Thanks for sharing this special place. A perfect place to celebrate our 11th wedding anniversary, East Bedarra is an absolute paradise…. The sunsets, the turtle, the pool and the walks. Thank you Sharon for everything!! Thank you Ben & Lindsey for looking after us. Absolutely beautiful location! Stunning views and fantastic walks (especially to the lookout). Perfect honeymoon destination. This island is a great place to escape reality & really chillout. The weather weather wasn’t so kind to us but we enjoyed watching the changing landscape from the deck & exploring the island with its turtles, birds, butterflies, coconuts, fish, unidentified night animals! (Matt said it sounded like a terradactyeryl haha). Fun memories for our honeymoon. Thank you for such a beautiful place to spend our honeymoon – 9 lazy days of swimming, snorkeling & relaxing. And thanks to Ben & Lindsey for all their wonderful hosting. We’ll be back one day. An amazing place to celebrate our honeymoon and my birthday. It truly is paradise and after 2 weeks here we are going to miss the peace and quiet, the sound of the ocean and turtle watching. Thank you for a wonderful stay. Amazing paradise, the house, the beach and surroundings are truly beautiful. Enjoyed the peace & serenity and couldn’t have wished for a more romantic holiday. Thank you Colin and Jason for the fantastic fishing experience, can’t wait to return and will hold these special memories. What an amazing way to start 2014! I am not sad I am leaving, I am so happy to have found this place and to have spent 7 wonderful days and nights on this amazing hideaway!! Just what we both needed. I’ve never been more relaxed and content in my life, this has been my absolute dream paradise, from Colin & Elaine to the house to the water. My family and I have been so extremely happy feeding the eel was incredible and simply taking in the beauty is remarkable. Thank you for some of the best days of my life, after studying for my finals at Berkeley this was a dream come true. It would be the ultimate dream to come back one day, thank you Gene and Sharon. I cannot thank you enough for this life changing experience. I feel like the luckiest girl in the world to experience complete paradise and relaxation. I will remember these past couple of days for the rest of my life. I can only hope to come back here one day, thank you!!! Lynette & I came here 10 years ago & I proposed to Lynette – she said the house has changed due to the storm damage. It was paradise – it still is, with an even more beautiful house and amenities. We hike every trail, snorkeled, kayaked, fed the eel and totally relaxed like never before. We love and cherish this magical place. Gene and Sharon thank you for all you have done to make this such an amazing holiday. This spectacular soulful retreat will always hold a very special place in my heart not only because of our engagement and reconnecting with dear friends 10 years ago but the sense of peace I feel here. I feel so fortunate to be able to return and enjoy with my family the stunning wonders of East Bedarra, Gene & Sharon words cannot express our gratitude. What a fantastic place, we totally unplugged here, was a great way to spend our honeymoon & will be back again. Loved seeing turtles everyday & Eric the eel eating scraps. 5 days just wasn’t enough time to do nothing. This is our last night in paradise! Nick and I have thoroughly enjoyed the time on East Bedarra to re-charge and relax it is our hope that one day we return to East Bedarra to do it all again. Thank you! Had the most amazing time so relaxing and beautiful. Thank you so much would love to come back. What an amazing destination – I don’t want to leave and can’t wait to come back. The perfect place to rest, relax and rejuvenate the soul. Thanks for a great time, was a much needed tranquility for the soul. This was fantastic getaway to relax after getting married. Beautiful views, smells, sounds and a great place to unwind, as close to nature as it gets. What a place to spend our first week as a married couple! It was everything we wanted – relaxing, beautiful and private. Cannot wait to come back. Couldn’t think of a better way to celebrate our 20th anniversary. Beautiful, relaxing and peaceful thanks. Such a beautiful home on a beautiful island, the perfect location for our honeymoon, thank you for everything during our stay we will be back. What a great end to our honeymoon. We enjoyed the beaches & pool and what an amazing deck thank you! Well what do I say other than 'thank you'. I can't begin to tell you what a wonderful time Bob and I had at East Bedarra. As soon as my feet hit the sand I felt this amazing sense of peace. When I walked into the house I just cried with happiness. I found a couple of special places on the beach to meditate and wrote my affirmations in the sand each day. We loved everything about East Bedarra! We would like to book for October 2014! Beautiful pot, lovely cabin & just loved the deck! All the best. Wow what a beautiful place, the layout amazing is amazing. Such a lovely peaceful holiday! Best place we have ever stayed, thank you Colin & Elaine what a peaceful place to be, we will be back. We had an amazing time – so relaxing, didn’t want it to end. Thank you Elaine and Colin for welcoming us and for also making us feel like we were the only people here. Hope to return again. I cant describe in words what a magical trip has been. Such a beautiful location & accommodation completed with 2 wonderful people making sure everything was perfect – thank you so much Elaine & Colin, you really helped get us through an amazing adventure for our wedding! We will be back next year to see some sunshine I don’t want top leave!! We stayed here 7 years ago & thought it couldn’t get any better – but this sensational. Elaine & Colin were wonderful – very accommodating but mindful of our privacy at all times, we plan on coming back very soon. DREAMY! DREAMY! DREAMY! We’ve dreamt of coming here for ages – and it was everything we wished for and more! Compliments to Elaine & Colin for being such welcoming hosts yet so respectful of our privacy! LOVE, LOVE, LOVED IT! Thank you East Bedarra – we hope to be back again soon. This is such a special & amazing place; we have never felt so relaxed in our lives & rarely looked at the time! We will never forget our honeymoon! 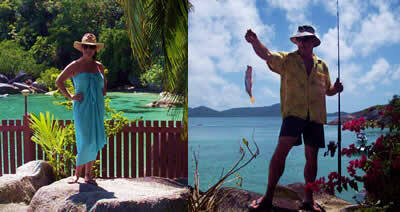 The special time we spent on Bedarra – thanks Colin & Elaine oh and we caught a shark fishing! A wonderful place to begin our married life! The setting made it perfect place to recover from our wedding and sneak in some romance thank you. Perfect place to spend our honeymoon, absolutely gorgeous views, perfect weather and fantastic accommodation. So relaxed after our time here, worse thing is returning to reality! Hope to return again for one of our anniversaries, loved our time on East Bedarra. A magnificent setting for a wonderful relaxing holiday, it will take a barge to remove our empty wine, champagne and beer bottles! Colin & Elaine gave us a wonderful tour of the island and great privacy – thank you! We had a fantastic honeymoon filled with relaxation, adventure and romance. We even got to see a stingray! Thank you so much for allowing us to stay at such a beautiful place. My husband of 22 years turned to me on our last night and said “I will remember this prefect time and place…. Thank you for organizing such a perfect time for us…” even after 22 years he still makes my heart melt. A truly beautiful have for overworked adults. Our stay at Bedarra has been magical and amazing. Time really does stand still here and we have as a result slowed down and reconnected with each other and the simple joys of nature; the sunsets, sounds of the waves, the ebbing of the tides, the native creatures. We truly enjoyed our stay. Thank you to Colin and Sharon for looking after us! Amazing! What a magnificent spot and accommodation. We absolutely loved it. Thank you for making a memorable moment so special for the newly engaged couple. I came here for my 60th birthday; it does not get any better than this. You have time to reevaluate your life. The beauty the quietness is incredible; the owners have done an amazing job after a cyclone, capturing nature with class, not spoiling either one. Well done this is truly paradise unforgettable! Thank you both so much for what has been the most incredible honeymoon – better than we imagined and much more than we could have hoped for. Bedarra is a magical place, we will treasure our time here. Beautiful Bedarra! We love you, always, Sharon and Gene it’s clear to see you love Bedarra and she loves you back! You’ve created heaven on earth here, Colin & Elaine thanx for looking after us so well. “A Tropical Island Fantasy” ... Words can hardly describe East Bedarra Island Retreat. From the moment we arrived it was the tropical island fantasy you dream about: stepping off the boat onto the sand of a beautiful little bay, the retreat was right there at the water’s edge. The retreat is tasteful and modern with water views from every room…including the bathroom. We were happy to find that the retreat is eco-friendly accredited and picked up some good tips to take home. For the first day we didn’t leave the deck and just lazed on the sunbeds and swinging seat before venturing out to discover the island. Thanks Sharon for designing a very memorable holiday. It wasn't long enough and we will definitely be back. “Wonderful” ... We highly recommend East Bedarra Island Retreat as it is truly lovely but simply recommend that if you plan to stay more than a few days make sure you consider options unless you are content with staying at the Retreat. “Simply sensational” ... The sunsets were out of this world and the stars each night gave us a romantic setting for just the two of us, we really didn’t want this honeymoon to end. I loved seeing the turtles pop their heads up, we could see them clearly from the deck throughout the day. I thoroughly recommend getting up for a sunrise paddle ski - Set you alarm! Thank you for making our honeymoon truly unforgettable - maybe we will be back for our babymoon soon!! "Absolutely Amazing" pretty much sums it up! East Bedarra Island Retreat was a truly magical place to stay for the start of our honeymoon late April - early May earlier this year. Picture perfect weather, fantastic views, very private, and truly relaxing. East Bedarra Island Retreat – what an amazing, beautiful, romantic place. We stayed here in March 2012 where my now fiancé proposed after a beautiful romantic dinner on the deck. The retreat is very secluded and has the most stunning water views, we spent most of our time relaxing on the deck, this really is a place to unwind! There is every amenity you could possibly need and the caretakers were most welcoming and made our stay extra special. We can attest to how much Sharon’s professionalism and accommodating nature ensured our engagement was unforgettable. After meeting with Sharon following our stay, we can see just how much love and attention to detail has gone into making this retreat truly memorable. From initial enquires, bookings, water taxi and to the caretakers, each and every detail is dealt with the utmost professionalism and we cannot recommend East Bedarra Island enough. We cannot wait for our next stay!! It has been amazing experience, one that we will never forget and hope to visit again!! We’ve walked the island, paddled around it, watched the crabs, feed the crabs, saw the eel, snorkeled, swam, relaxed – what more could you ask for!! We’ll miss falling asleep and waking up to the sound of the waves crashing beneath us, pure bliss!! Till next time bye bye!! We drove up from Sydney and were rained on every day until we finally reached East Bedarra where the clouds disappeared and we were treated to the most perfect weather, water and welcome from Colin & Elaine. Our eight days here have been true paradise and we wish it didn’t have to end, we will be taking a little bit of the islands magic home with us. Beau and I have loved our time on the island and we leave feeling very balanced, centered and completely relaxed. We’ll remember this as one of our best trips yet and the honeymoon we wish for! We are visiting Australia for our honeymoon and East Bedarra is our first stop. The island is absolutely breath taking and the best way to spend the first days as man & wife. Everything here is perfect, we have reached true tranquility on the island. There is no time here, on the island as if time stands still it’s mind boggling how peaceful life can be here. We will definitely be back for another vacation as there is no place this relaxing in the states. Who needs the South Pacific when you have the most amazing beach aspects right on your front step. We couldn't have dreamed of a better location for the first half of our honeymoon! Such a spectacular destination and so nice to have the privacy and comfort for the wind down after the big day. The pool was fantastic, Colin and Elaine such wonderful hosts. We can't thank you enough for your kindness, we hope to come back and visit again for our 5th year wedding anniversary. All the best Tim and Belle Collings. My husband and I have celebrated in many places around the world and East Bedarra is by far the most private, and the Great Barrier Reef at our door, the freedom to set our own pace to wake up at any time of the day to a beautiful view that we couldn't wait to wake for. The fall asleep to the natural sounds of the ocean. We loved our skinny dip each morning and sunset drinks in the afternoon with our regular visit from the turtles that call this their home, the sunbirds that would play in front of the bungalow made this all part of the natural beauty. Although there are two stunning beaches we preferred to spend a lot of our time in the Natural tidal rock pool. The large decks offered us a lot of outdoor living space, the sun lounges were perfect for us to relax, while my husband didn't move from the hammock . We certainly had time for each other and every day was special, this is what life should be like every day, my advice for anyone is to stay as long as you can and bring more champagne. 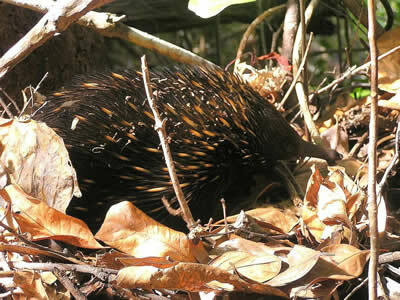 The experience of seeing an Echidna was absolutely amazing we never imagined such a beautiful sight the superb sunrises to the stunning sunsets and all that skinny dipping with champagne (French of course) glass in one hand really set the scene for the most beautiful romantic honeymoon imaginable. We will be back to celebrate our anniversary, so could you please pencil us in for same time next year. just wanted to drop you a line or two to congratulate you on your efforts to provide a wonderful venue for a holiday. To be honest I don't know how you can bring yourself to let out the place I would want to live there for ever! Liz and I had such a wonderful time doing nothing much at all just soaking up the feel of the place. To be honest I think I discovered two things while on Bedarra. Firstly, I found my calling in life, I should have been a beachcomber, and secondly I am now convinced that I am at my best when doing absolutely nothing! Bring on retirement. All silliness aside I also wanted to let you know what assets Ruth and Steve are. Two more friendly and helpful people would be hard to find. The bungalow was beautifully presented and their welcome and hospitality was flawless. Hang on to them they go a long way to making the Bedarra experience so wonderful. Maybe one day we can return, who knows what the future holds. 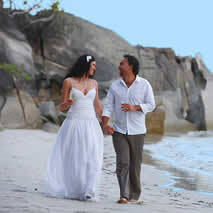 We were looking for a romantic island honeymoon we found Bedarra over the internet. We fell in love at first sight although we took a risk at that time of year as we heard it was the wet season. After a bumpy ride on the water taxi, we arrived at a very calm and and beautiful sandy beach. The hosts were waiting on the beach with a bottle of Moet and took our bags, as we made our way with our glasses of champers to the deck. We were blown away by the spectacular views to the other islands and Australia it was like living in a painting. we finally worked out that we were there for 3 days, so we decided to get on the paddle skis and paddle around the island, which took us about 1and a half hours as we stopped along the way to discover some of the most beautiful small beaches and caves and the next day it was time to leave the Island. our only complaint was that 4 days was not long enough and I should have listened to my husband who wanted to stay longer! We loved the beach hut, it was like having a holiday in one of the pacific island burres, very open and natural and everything worked well. The bathroom was a little small and veryspectacular views...we will never forget our days on Bedarra and will be coming back again for our first anniversary next year. East Bedarra is truly a paradise and was a great place for us to spend our honeymoon. The experience is indescribable and so we will do our best... if you are reading this and thinking about planning a trip to East Bedarra, stop thinking and go ahead and book it. 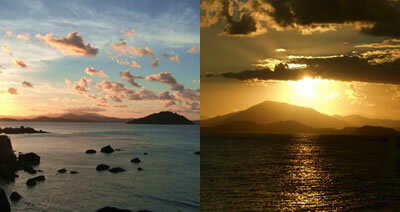 The experience is amazing from the beautiful sunrises to the fabulous sunsets. You can choose to be active or just choose to relax. The accommodations provide the opportunity to completely unplug from daily life activities and to recharge and relax. From the fresh sea breeze that replaces air conditioning to the sound of the ocean waves crashing along the rocks outside your bedroom window each night, you get to experience nature in a way you never have before. Additionally, the accommodations are run with solar power and you bathe, cook and drink fresh spring water from the island itself. And this review would not be complete without mentioning the owners and the caretakers of the property. The individuals who run East Bedarra as well as Misty Mountains want to ensure that you have the best experience possible while at these locations and they are there to assist you from the day you inquire about the property through the time you leave. Thank you! Liked - The opportunity to unwind and unplug in seclusion. Dream honeymoon in a dream location. This is the place you are looking for! East Bedarra was just magic....it's paradise! We all enjoyed our time there. The boys enjoyed the water but unfortunately it went very quickly. Steve and I extended our stay in Cairns then stayed at Port Douglas for few days before heading home. I will definitely recommend Bedarra to all my friends and colleagues. I thank you so much for giving us the opportunity to experience your beautiful private retreat. From the moment we stepped onto Bedarra Island we knew our dream day would become a reality... the magical beauty of Bedarra Island took us in the instant we arrived and we continued to enjoy a week of total bliss..
Dorilla Bay, was a picturesque backdrop for our wedding ceremony.. The waves crashing on the shore behind us, and the sun setting over Bedarra Island in the distance made it an unforgettably romantic experience. The rainforest on Bedarra Island now holds a special place in our hearts as it brought a unique sense of connection with nature..
Lazy days and star filled nights, we were so relaxed and at peace. We could not imagine anything else in the world comparing to East Bedarra. It is a magical, romantic place that makes years of stress just fade away. Being able to take your kayaks around your own tropical island is divine, private beaches, beautiful views, stunning rock pool, what more could one ask. It was an amazing time and we would like to thank Sharon, Gene, Ruth and Steve for making our honeymoon wonderful. We wish we were back there right now! We are back in Melbourne ( brrrrrrrrrrr ) after a most beautiful honeymoon on Bedarra and a visit to the Gold coast. We just wanted to thank you for opening up your patch of paradise and sharing it with others. We had an amazing time and enjoyed perfect weather. Ruth and Steve were just the sweetest and most helpful hosts we could have asked for. We just adored it and hope to gather a group of friends for another visit at some stage. Island life really agreed with us. We hope you are well and have attached some photos for you to see how much fun we had. 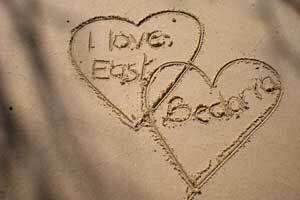 We just want to let you know how much we enjoyed our stay on East Bedarra Island. It was everything we had hoped (& a lot more). I don't think either of us have ever been so relaxed in our lives. The weather was devine & I am now sporting a beautiful tan, (with no tan lines!!). We've been home for just over 24 hours and we are missing it terribly, of course the fact that it's only 15 degrees here doesn't help. Ruth & Steve were absolutely lovely & very helpful. Could you please pass on to them for me, that I found copies of the book they lent me about the Family Group of Islands, for sale on Dunk Island in the Boutique, so I've bought one myself! Anyway, we hope to return to your lovely island one day very soon, until then, take care. Thank you very much to yourself and Gene for sharing the wonderful piece of Paradise that is East Bedarra. Despite the weather, we had a terrific time and enjoyed the enforced relaxation and the beautiful surroundings. 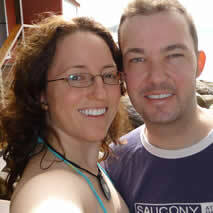 I have attached a photo of us enjoying our first day on the Island. We loved the fruit bats, geckoes, skinks, the beautiful sea eagle, the sea turtles, the honeyeaters, the Ulysses butterfly, all the other butterflies, the kingfishers and then we were lucky enough to see a cassowary on our way back to Cairns! So, thank you very much for allowing us to share in your wonderful retreat, and particularly for your generosity in allowing us to stay the additional night. It was a lovely opportunity to get to really know each other again, after the trials of the last few years. Loved the recent stay at East Bedarra. I thought next time I would hire a dinghy with motor to visit some surrounding islands as well as fish! An enchanting location - loved the privacy, butterflies, turtles, manterays,and all of the other natural wonders of FNQ's East Bedarra Island Retreat. PS Broke 2 champagne glasses but what a memorable honeymoon! “ In East Bedarra we found a place of serenity, stress relief and peace. We did not watch the time we watched the tides. We did not think about what day it was, we counted how many sunsets we had left. What an incredible sanctuary after an amazing but stressful we will be back someday! What a perfect way to spend the first few days of married life, absolute heaven! Thanks for sharing such a beautiful piece of paradise, we will be back. What a beautiful place to celebrate 15 years of wedded bliss, a momentary glimpse of what heaven will be, time relaxing, enjoying one another and the beautiful Island around us. Everything was much better than we thought it would be and so much more private than a big resort.. We wont want to ever go to an island resort again. We've been back nearly a week now and have settled back into our everyday lives. Looking back at our stay on Bedarra all seems like a fantastic dream - one that we have to remind ourselves was actually truly lived! Thank you again ever so much for all of your efforts in making it happen. I intend to send your 'thank you token' this week and apologize for the delay. My desk at work was overloaded with work and our sleep patterns have just now returned to California Time. I do hope to remain in touch as I have come to think of you as a far away friend. Please do keep us in mind if ever in Los Angeles. I told my friends that we were moving to denial so that I could turn 40, with some peace and dignity. This was the best place to be to forget all of life's worries, 6 sun filled days for kayaking, swimming, eating and 4 rainy days to sleep, relax and unwind, a perfect balance.